Rubber that is formed by using a method known as calendering is known as calendered rubber. Such type of rubber is used to produce different products like rubber sheets, rubberized fabric, elastomeric films etc. Calendering is a mechanical process in which rubber or plastic is pressed. It is a finishing process which is applied to textiles and paper. During the process, fabric and rubber or plastic material pass through heated rollers to flatten, smooth and commingle the two or more materials and give a shiny, flat and smooth surface. The final surface characteristics depend on the pressure exerted by the rollers, on their composition, temperature, surface designs, type of coating or glaze initially applied to the material to be calendered. After the calendering process the material is then wound into rolls and placed into storage. 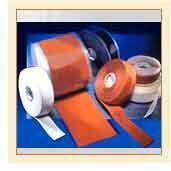 Rubber Sheets: A very common product formed out of the calendering process is calendered rubber sheets. They can have multiple layers of both the elastomeric and polymer "combined" together. Rubberized Fabric: Rubberized fabric formed from calendering is smoothed, glazed, polished, or given a embossed surface, depending on its use. Suppliers can supply calendered rubber products in the form of Sheeted Stock, Frictioned Fabric or Skimmed Fabric as per clients recommendations.